Five-thousand people died at Choeung Ek. Their remains are inside a Buddhist stupa. I have never been moved so much. After I spent more than an hour listening to the commentary about the genocide that killed between 1.2 to 3.4 million people between 1975 and 1979, my eyes began to tear. 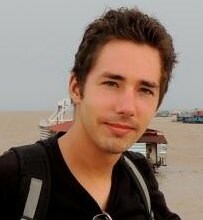 As an American, I only briefly learned about what happened in Cambodia when I was in middle school. 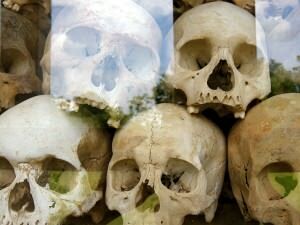 It was simply a blurb in a textbook, and I remember a picture that showed the skulls from either the memorial at Choeung Ek or the Tuol Sleng Genocide Museum. However, it doesn’t do justice to the people who died. For me, it was important to visit these places to get a better understanding of what happened during the Khmer Rouge regime. Pol Pot and the Khmer Rouge came into power in 1975 and ruled for nearly four years before Vietnamese soldiers overthrew the government. During that time, people were moved into the country and forced into grueling labor to fulfill Pol Pot’s vision of an agrarian society. However, this was far from pleasant. People worked for hours in the fields without breaks, only receiving a small bowl of rice porridge a day to sustain their bodies. Even then, that was generous. Some people only received sawdust. Conspiracy was rampant. Wearing glasses or speaking a foreign language was enough to be subjected to the brutal interrogation of the Khmer Rouge. People were tortured until they fabricated stories that they had worked for the CIA and other espionage agencies to overthrow Pol Pot’s government. While many were executed at prisons like S-21, many other people were taken to a killing field, like Choeung Ek. There, they were bludgeoned with shovels, hammers or other tools. Bullets were considered too valuable to use in the genocide. The admission fee into Choeung Ek includes an audio track, which is what made the experience so emotional to me. The Khmer narrator describes the murder, the unsanitary conditions, the fear and the uncertainty that occurred at this site. I had a map in hand that guided me to now non-existent shacks that once housed weapons and gas. They have since been torn down either out of rage or out of necessity for supplies. As many as 20,000 men, women and children were tortured and died at S-21. Only seven people survived when the Vietnamese arrived in 1979. After this, I came to the first of several mass graves. If I looked closely, I could see bone or tooth fragments seeping out of the ground. This particular mass grave was for Khmer Rouge soldiers who disobeyed orders. 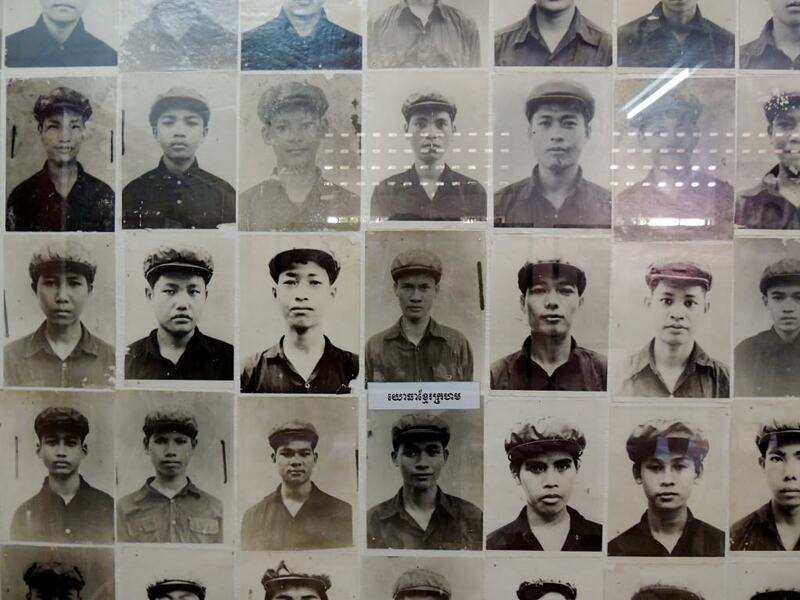 Even for their own, the Khmer Rouge had no mercy. Their soldiers were slaughtered in the same way that thousands of other people were across the country. Babies were also murdered here. Soldiers would dangle them by their legs and smash their heads against a tree. Today, this tree is decorated with hundreds of colored ribbons to remember the victims that died here. As I heard the horrendous details of what happened, my face became grim. I walked solemnly to one of the final destinations on the map. I arrived at a tree, which had been used to hold the speakers that blasted patriotic music for the Khmer Rouge. This, along with a diesel generator, was used to cover up the screams of the victims. “These were the last sounds the victims ever heard,” the narrator said on the tape before he stopped talking and let the music play alone on the audio track. 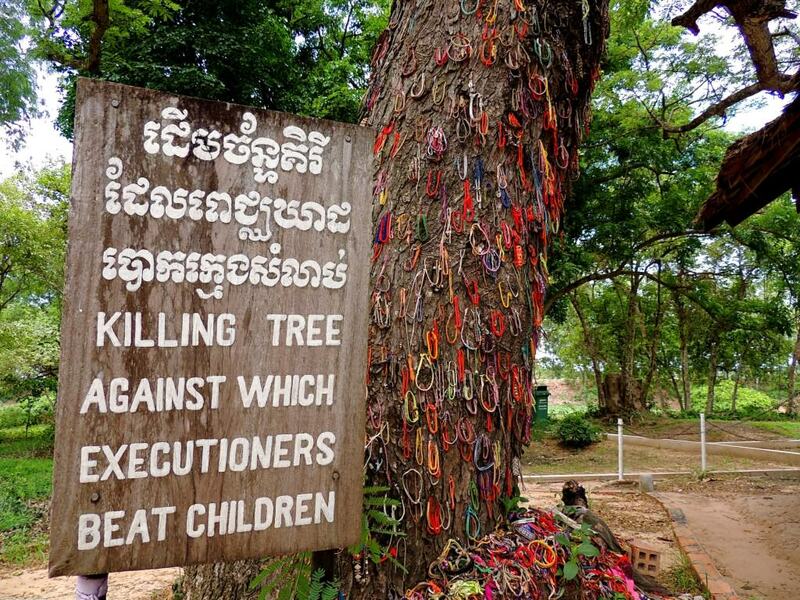 Babies and young children were dangled by their legs and beaten to death against this tree. Paintings depict this at Choeung Ek, but I chose not to include them in the album. It was powerful. My hair stood on end, and my eyes watered as I felt the turmoil of the victims who died in this hell hole. I composed myself and walked back to the entrance. A giant stupa was built here to house the remains of the victims. Thousands of skulls and other bones are encased in glass, along with the rags that remain of their clothing. It is hard to imagine that humans are capable of doing these sorts of things to each other, but by visiting this site, I think it tries to teach the horrors that can happen when people or governments idly watch and let mass killing occur. Instead, I believe it is our duty as human beings to intervene before these atrocities occur. Pol Pot died before he stood trial in Cambodia. Only one Khmer Rouge leader, Kaing Guek Eav, has been sentenced by the country’s judicial system. Eav received 30 years in prison after he admitted his role in heading a torture center. Trials are still ongoing for the rest of the Khmer Rouge leaders. Have you been to the Killing Fields or another place that documents “dark” history? Share your thoughts below.